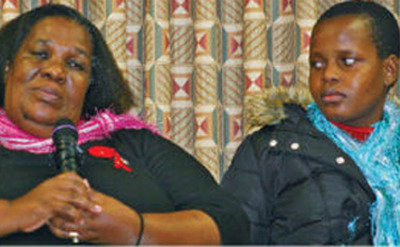 Through the efforts of the Merville Grand Mothers, African grandmother, Tsabile Victoria Simelane, and a beautiful young woman and granddaughter, Thandeka Carol Motswa, visited the Comox Valley. Their visit was part of AfriGrand Caravan: a cross-Canada tour sponsored by the Stephen Lewis Foundation. At a standing room only event MC'd by Merville Grand Mothers Janet Fairbanks and Darry Oudendag, the guests were greeted with a traditional welcome from the Kumugwe Dancers of the K'omoks First Nations. Ryna Olonan, who was travelling with Tsabile and Thandeka, brought greetings from the Stephen Lewis Foundation, and introduced the two women, who then told us their stories. Both Tsabile and Thandeka spoke about the losses in their lives – losses that we cannot imagine enduring. 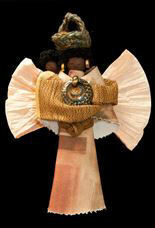 Thandeka looked after her mother when she was dying of AIDS, then lost her when she was only 12 years old. Shortly afterward, her father died in an accident. She was forced to leave school, become the head of a household, and look after 3 younger siblings. SWAPOL has helped both women by providing farm inputs, food, clothing, and primary school fees. However, SWAPOL’s limited resources do not extend to paying school fees for Thandeka to go to high school. Education is her goal, she wants to become a nurse. And, Tsabile dreams of a vocational school in the community for other young people who have not had the chance for post-primary education. The fist against HIV/AIDS is not a losing battle. Progress is being made. The evening was rounded out by rousing community singing led by Letz Sing Choir Community. Audience members also had a chance to see the Glacier Grannies' beautiful fabric art display, “Turning the Tide ... one ripple at a time” and to buy gift items created by North Island Granny groups, including the Glacier Grannies. In the afternoon, Thandeka Carol Motswa spoke to high school students from across the valley at Mark Isfield School. Earlier in the day the Glacier Grannies organized a luncheon for the SLF delegation and other grandmother groups. The event was fully sold out, the food was excellent, and it was a wonderful way for many North Island Grandmother groups to come together. Fundraising Bicycle Ride: Support our cyclists! 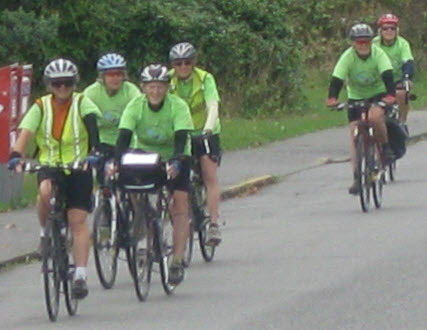 A group of 21 Vancouver Island grandmothers and “grand others” stopped in the Comox Valley while on a fund raising bicycle ride from Campbell River to Victoria. The Glacier Grannies organized a lunch for the riders and their supporters. 45 lunches were served and the weather cooperated by not raining! Hats off to the bikers, who all completed the trip safely. Thanks to Gail Higham and Lorraine Waring for coordinating the lunch, and to the enthusiastic "gals" who contributed food and provided assistance. Jean Munro, who has recently returned from two and a half years in Ethiopia, gave a talk and power point presentation describing the lives of the nomadic Pastoralist women of south east Ethiopia. 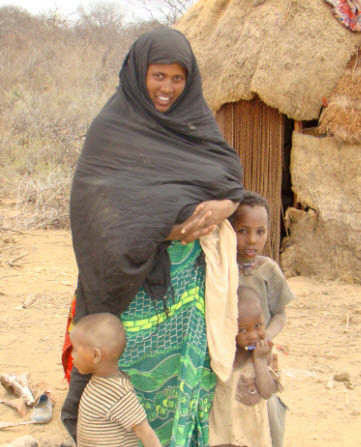 Pastoralists are people who live a nomadic lifestyle and who highly value livestock, primarily camels. Jean's work as a consultant with the Pastoral Concern Association of Ethiopia exposed her to these women's struggles to obtain basic human rights, and she told us fascinating stories of their lives and the heroic efforts they are making to improve their situation. to Comox United Church for providing the hall. Special thanks to everyone who made a donation to the Stephen Lewis Foundation. A big group of Grannies, their friends and partners enjoyed an evening of food and conversation to celebrate the success of our Textile Art exhibition. Ed F. rose at 4:00 a.m. to prepare a succulent barbecue of pulled pork and roast beef and served us in his chef's hat and apron. A pot luck of delicious dishes rounded out the meal, and we had a wonderful evening. Thanks to our co-chair Barb T. and her husband James T. for hosting this event. Sally Gellard, of the Merville Grandmothers, and Gloria Hebert, of Hornby's United Grandmothers and Grand Sisters, presented a talk and slide show about their recent visit to Africa and their experiences at the Swaziland Grandmothers' Gathering, the first International Grandmothers' Gathering in Africa. 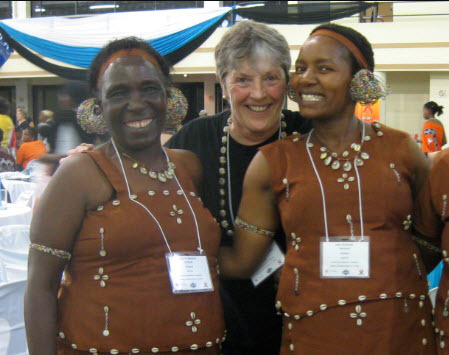 The Gathering brought together 500 grandmothers from thirteen countries of sub-Saharan Africa under the auspices of the Stephen Lewis Foundation. With passion and humour, both women described their experiences as members of the group of Canadian grandmothers who were privileged to be observers at the conference, and their participation in the Solidarity March. For each of them, the highlights of the events were their opportunities to meet and share the stories with the African grandmothers. The conference produced an action plan, the Manzini Statement, which was read to the audience by members of the Merville Grandmothers. The evening, which was held in conjunction with the Courtenay showing of Textile Art for Africa, was rounded out by a rousing performance of African songs by members of Letz Sing, and refreshments provided by the Glacier Grannies. A big thank you to Sally and Gloria, the members of Letz Sing and the Florence Filberg Centre for providing the Rotary Hall for the event. View a short, inspiring video highlighting the Swaziland Gathering.